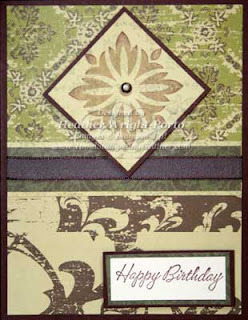 This masculine card was created to coordinate with the FAMILY Chipboard Album (http://heatherporto.blogspot.com/2008/06/family-chipboard-album-home-again_4178.html) I recently posted, although the Designer Series Paper is not part of that kit, I felt the chocolate chip and "greens" would match the project. Also, I like the card and wanted to share it anyway! This designer series paper (Brocade Backgound) is now retired, but I still love it and luckily I had some left. Hi, Heather! What a great card! I just wanted to stop by and say thanks for all your hard work at SUDSOL. I appreciate all you do!